This scene of carnage is depicted with stark brushwork and earthy colors which seem to suggest a twilight scene on the Serengeti. In desolate areas such as this, Cherubs were known to breed like mosquitoes. A swarm of them could strip the flesh from a victim in a matter of seconds. They were commonly known as "God's Little Piranha". The name CHERUB derives from their rather gruesome habit of CHEwing their victims flesh and then RUBbing the blood onto their deceptively cute cheeks. Savage as these Cherubs were however, they dared not disturb this pack of feeding vampires which have claimed the fallen martyrlope for themselves. Martyrlopes are prized by vampires for their wine-like blood. It has also been reported that their flesh tastes remarkably like lamb. Several of these vampires are shown here salivating over the hands and feet while the alpha male of the pack (there on the left) is preparing to sink his teeth into the jugular vein. Various lesser members of the pack linger nearby awaiting any scraps that may remain after the others have had their fill. 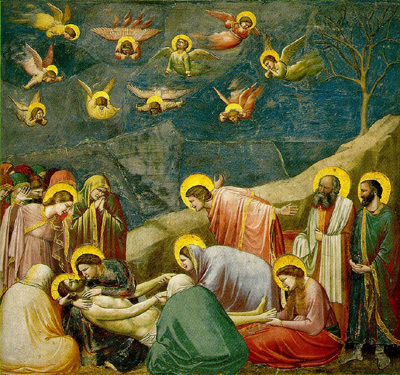 Giotto was criticized for callously painting this horrific scene while not lifting a finger to assist the wounded martyrlope. In his defense, it should be noted, that he could easily have become a victim himself. In fact, it was only through exceptional courage and a steady hand that he was able to capture this grisly scene for posterity.